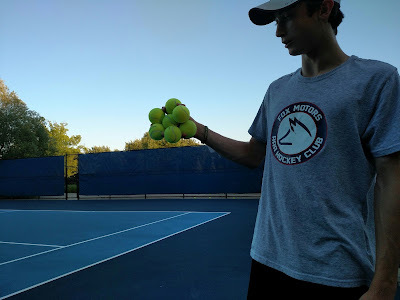 Eli 14.11 can't really hold seven tennis balls for long, so the picture is slightly misleading, but he can hold six for as long as he wants. I've been teaching him (somewhat) for years, but it had gotten to the point where I really felt like I was holding him back. Tennis circa 1985, and the proper instruction, is not very relevant in 2016. Good coaches know when to step back and let someone else coach. In an incredible stroke (awful pun there) of good fortune, though, we met someone here who is an absolutely terrific instructor, and he teaches the way Eli learns--like an engineer. He's taken four lessons so far, and I can't believe how much better he plays already. All the good qualities of his game--athleticism, intelligence, power, and touch--are still there, but they're now in a more fundamentally sound package, with strokes better suited for this century than last. Plus, I think he's serving 100 MPH on his first serve at this point. Not kidding. Still hasn't beaten me yet, though. Old Man Garbage Tennis is still competitive for a little while longer.